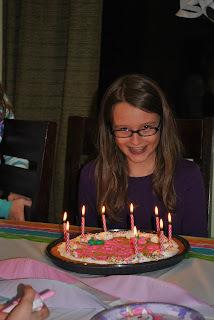 M turned 9 on Friday (Dec 16th). 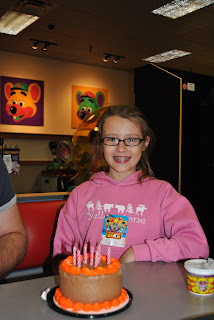 She is only 1 year away from double digits and is half-way to driving -- yikes! M is such a smart, caring girl. She loves to read, likes science and has some really great friends at school. She likes to play school, her room is always a mess, and she always has some sort of art or writing project in the works. This year, she's not only playing piano, but at school they are learning to play recorder and violin. She is really enjoying strings and has asked for a violin for Christmas -- I told her she had to wait until next fall, but I have a feeling we'll have many more instruments in the house before it's all said and done.